A mighty cool and inviting spot on a very hot summer day. The flow of water mesmerized my toddler. 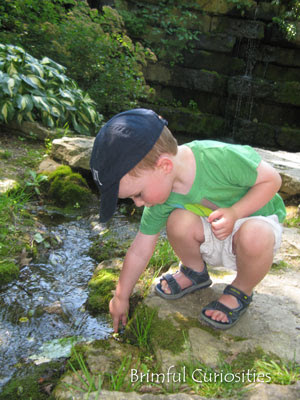 Did he see tadpoles, frogs, or fish in the stream? I was waiting for you WW, and then went on vacation. WOW that looks so nice and peaceful! My parents have a backyard that looks like that. Not us! We're working on it.